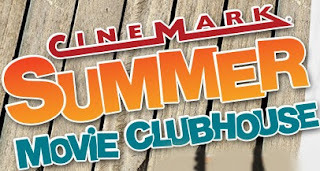 One Momma Saving Money: Cinemark Summer Movie Clubhouse! $1 movies this summer! Cinemark Summer Movie Clubhouse! $1 movies this summer! The Summer Movie Clubhouse is a ten-week program of recently released G and PG films for kids. Day, times and weeks of the series are determined by the local theater. A full list of participating theaters is listed at Cinemark.com. The cost is $1 per person per movie at the door the morning of the program. A ten-week series punch card is available at the theater box office or online at Cinemark.com for $5, while supplies last. Check your local theater to see what movies are playing and what times/weeks they are. Not all Cinemarks offer this deal.